During this period, the ties between Great Britain and the American colonies only grew stronger. Anglo-American colonists considered themselves part of the British Empire in all ways: politically, militarily, religiously (as Protestants), intellectually, and racially. 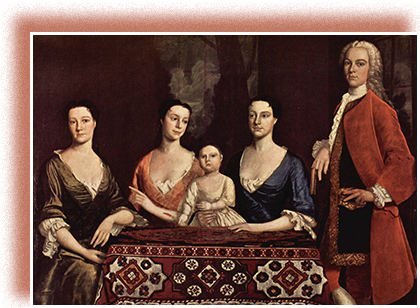 The portrait of the Royall family ([link]) exemplifies the colonial American gentry of the eighteenth century. Successful and well-to-do, they display fashions, hairstyles, and furnishings that all speak to their identity as proud and loyal British subjects.